Everyone is Different. Everyone’s body is different. Everyone’s fitness levels are different. Everyone has a different pregnancy. Having established the above – This is what I want to say – As an active mother of two equally and more actives kids, 8 and 5, I am here to break some myths on fitness during pregnancy. Brief on why I am choosing to preach – through the two sets of those 9 months each, I made deliberate efforts and was successful in staying in absolute fit condition. I walked briskly, practiced Yoga, mopped the floors in the last 2 weeks of the countdown and did not listen to anyone giving me unnecessary advice to slow down. My doctor was the only one I listened to and we made a good team! And so, I have a lot to share. In most parts of India – educated or uneducated – it’s a common belief that exercise can be dangerous to pregnancy. Even the doctors are reluctant to endorse active exercise during pregnancy. There is too much fear of things going wrong. There are too many family expectations attached to the game. I was given the same advice. To put up my feet! To get pampered! To eat for two people! But women must take charge of their health at every stage of life. While all this advice was going on, I seriously felt something wrong with all that was being told to me. How can sedentary lifestyle be good during any part of our lives? How can one person be advised to eat for two? How can bending down to pick up something I dropped be dangerous for my baby in my tummy? I decided to get even more active than my pre –pregnancy days. Decided to rest when my body asked for it and eat when my body was hungry! Some Pregnancy Fitness Myths I broke for myself and hopefully for the to-be moms! 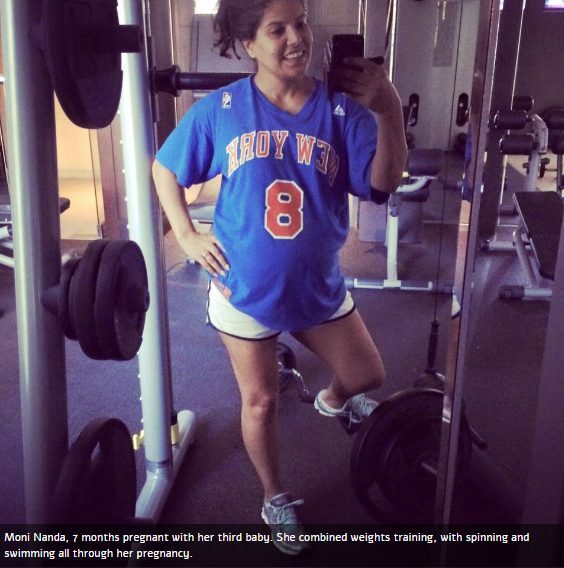 You have to be exercising before getting pregnant to be doing it while pregnant – No not true! If you haven’t done anything before yet have an active lifestyle, you can start with walking. From walking slow to building strength to walking at a moderate pace. Walking can never go wrong during pregnancy and otherwise. I walked every day during my pregnancies. People, who met me while on my walks, said I never looked fit than I did at that time! And that good looking confidence during pregnancy is a great booster! Isn’t it? Exercising during pregnancy puts the baby at risk – How can staying active put anyone at risk? What you really need to avoid is high risk sports! Get your doctors approval and figure out what form of exercise is doable for you on daily basis. Your baby is well-protected inside the amniotic fluid. Just stay away from moves that make you uncomfortable and get frequent advice from your doctor on your fitness regime. Remember your sense of balancing is shifting and you will need to be extra careful. Pregnant women should not exercise everyday – There are days a pregnant body feels very active. Then there are days when there is a feeling of exhaustion and the body asks for extra bedtime. Barring such days, 30 minutes of exercising on daily basis is very good for the body. Make sure to stay well hydrated before and after exercising. I stay with amazing memories of my pregnancy days mainly because I was extremely healthy and fit. I decided to make my own choices and learn my way through it. No phase of our lives should demand us to sit and bloat! Fitness is a way to wellness. This article was written in collaboration with a leading Gynecologist Dr. Swati Sinha. She is a consultant with Delhi’s famous Sitaram Bhartiya Hospital for the last 10 years. “Pregnancy is the ideal time for positive lifestyle modifications. Exercise in pregnancy reduces the risk of developing Gestational diabetes mellitus, preeclampsia i.e. high blood pressure and also helps in reducing chances of caesarean delivery. Some studies give strong evidence to point towards significant advantages in labor outcomes such as shortening of duration of labor. For most women, physical exercise does not increase the risk of preterm labor. Moderate exercise is not the direct cause of any adverse outcome. Guidelines from most international organizations support the role of exercise in labor and delivery. American College of Obstetricians and Gynecologists (ACOG) promotes the health benefits and safety of exercise in pregnancy in both previously active and inactive women. ACOG recommends that in absence of complications the women should do exercise of moderate level for 30 minutes for most days of the week .National Institute of Clinical Excellence ( NICE ) , UK , suggests moderate intensity physical activity at least 30 minutes per day for good health of pregnant women”. Did you exercise during your pregnancy? How did you benefit the most from it? Leave your comments , here!